‘BIRMINGHAM INNOVATIONS: THE STEAM ENGINE, ELECTROPLATING…AND THE AIRBAG’ BY JONATHAN REINARZ. In March 2015, I was asked to speak at a pathological society in Birmingham about one of their late members. This is a feature of the group’s biannual meetings, a difficult task, not least because the group started in the 1940s and its oldest members were often acquainted with its founding members. On this occasion, I faced an altogether different challenge, largely because no one had heard of the late Harold Round, who had, together with two other former members donated a piece of silver in memory of the society’s founder, Joseph Sankey. To add to my difficulties, Round had been a dentist, not a pathologist, like most of the society’s membership. In our internet age, even the most cursory searches produce some leads. According to an article on the history of Birmingham Dental School, the UK’s oldest school for dentistry, Round holds an important place at the institution. In 1906, Harold Round, together with John Dencer Whittles, was one of the first two people to be awarded the Batchelor of Dental Surgery (BDS) degree by the school. 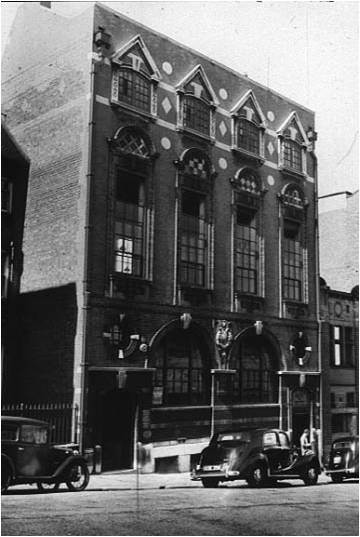 Brief correspondences published in contemporary dental journals revealed that Round then set up his own dental practice near the centre of Birmingham in premises at 141 Great Charles Street, Birmingham, shortly after graduation. Round ran an ordinary dental practice, which meant pulling more teeth than he preserved. His life, like that of many British citizens, however, changed significantly in the second decade of the twentieth century. During the First World War, rather than enlisting as a soldier, Harold Round joined the Army Medical Service, serving for the duration of the conflict at the First Southern General Hospital, a large military hospital that occupied much of the campus of the University of Birmingham. Round joined a jaw clinic run by surgeon William Billington, which treated mainly gunshot fractures to the face, but also other severe jaw trauma caused, for example, by airplane and vehicle crashes. 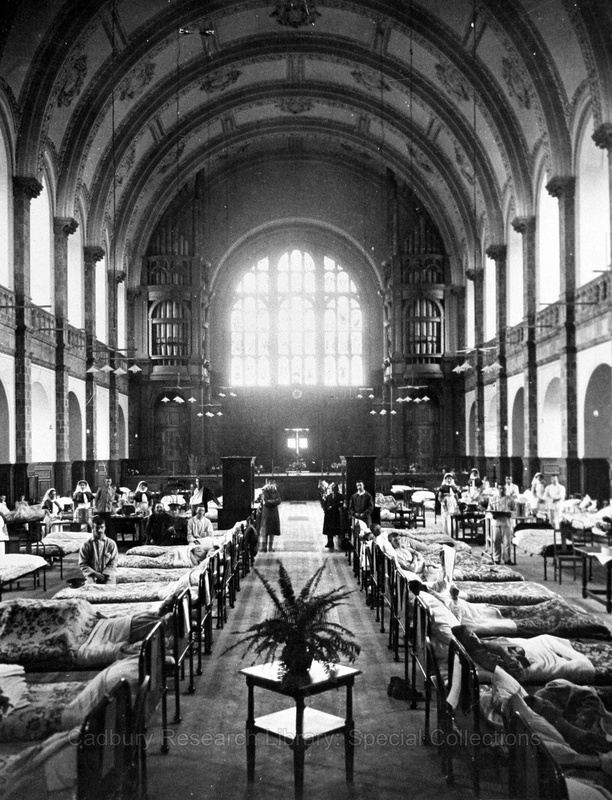 Most of his patients had been stabilised at field hospitals on the Continent before being transferred to Birmingham where specialist treatment and reconstruction was carried out. 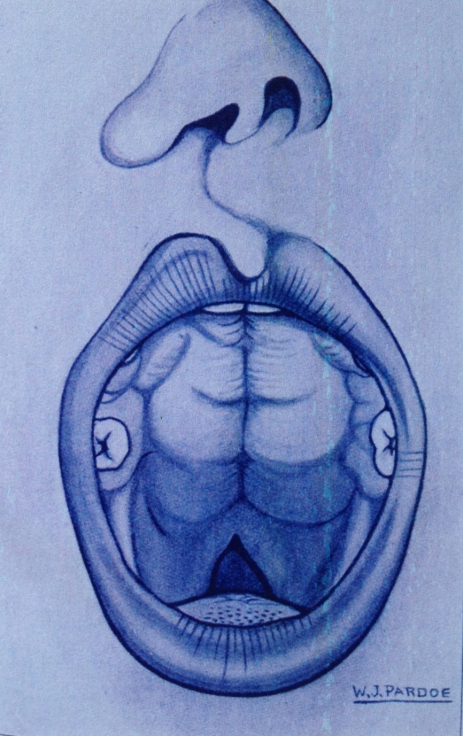 Prior to the war, attempts to repair gaps in the mandible using bone grafts had failed and were practically abandoned. At Birmingham, however, Billington, together with A. H. Parrott and Harold Round, resumed work in this area. Finding rib-bone too soft, and tibia too hard, the team employed grafts from the crest of the iliac, or hip bone, which were readily bevelled and more easily to incorporate into their patient’s damaged jaws. This work can only be described as revolutionary and was attempted at very few other clinics at this time. Case V.-Corporal J., aged 29. Wounded by shrapnel on October 5, 1916; was first admitted to First Birmingham War Hospital on October 20, 1916. There was an extensive lacerated wound over the symphysis, right body of mandible and right side of neck. There was entire loss of bone or about ¾ in(ch) in the region of 5 3 [denoting the position in the mouth], the mandible was practically edentulous, only the incisors remaining. In the first place an attempt was made to approximate the fragments by wiring-necrosis supervened and the result was a failure. Later an attempt was made to bridge the space, now about 1¼ in(ch) in width, by removing a piece of bone from the right angle and planting it in the gap. This also failed, the graft coming away into the mouth. The patient was transferred to the First Southern General Hospital on December 3, 1917. The remaining teeth in the mandible were extracted and the parts allowed to clear up well. On April 22, 1918, a bone graft measuring 3 in(ches) in length and taken from the ilium was inserted. The graft healed well and splints were fixed on May 7, 1918. Metal cap splints with vulcanite extension in the upper, were fixed by means of articulating tubes and bolts to a soft rubber-lined vulcanite splint in the lower, and the mandible being edentulous, a metal chin splint, struck to a model of the chin and covered with chamois leather, was worn. Good progress was made and the splints were removed on September 30, 1918, when good bony union was found to be established. Dentures were fitted and the patient discharged. 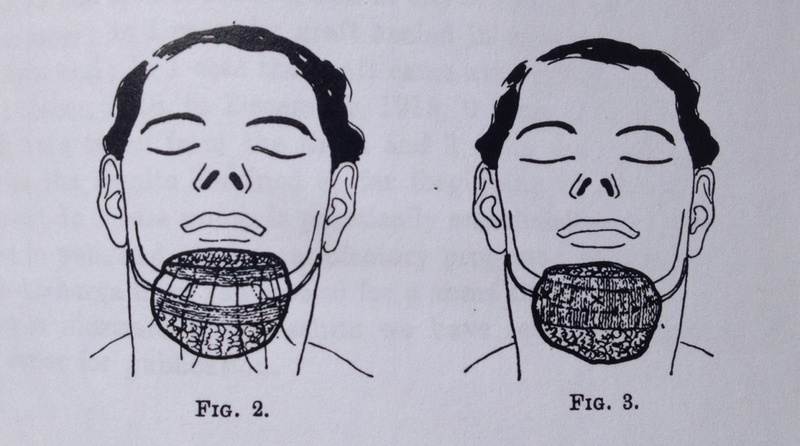 The Jaw Clinic treated upwards of 2,000 soldiers suffering similar jaw trauma during the war. In all, 75 of these involved grafting bone into destroyed mandibles. Faced with such severe injuries, it is hardly surprising that Round and Parrott, the team’s two dentists were determined in future to prevent this sort of injury. In their reconstruction work, the team had already shown great foresight and anticipated many difficulties of surgery and carefully prepared every aspect of their operations so as to aid the recovery of soldiers. For example, grafts were always taken from the same side of the body as the wound to ensure patients could sleep comfortably on one side. Demonstrating similar foresight in terms of prevention, the two dentists decided the answer to reducing such injuries in future lay in developing an airbag, which could be fitted into aircraft and automobiles and cushion passengers from impact in case of accidents. On 22 Nov. 1919, Parrott and Round filed a patent at the United States Patent Office; it was awarded on 17 Feb. 1920 (www.roru.de/airbag/us1331359.pdf). Clearly recognised as a precursor to the modern airbag, the patent is mentioned in all subsequent patents that were submitted by the major automobile manufacturers who have since improved this technology. Although Round and Parrott are recognised for their contribution, because their patent was filed in the United States, they are identified as Americans, not British, let alone residents of Birmingham, both in subsequent patents and on current websites (see www.unsere-autos.de/service/glossar/airbag/). At the war’s conclusion, Round returned to his new dental premises at 83 Newhall Street. Although Round and Parrott regularly wrote to the air force requesting that they introduce air bags into their aircraft, the Birmingham dentists appeared to have little luck furthering their campaign. Nevertheless, Round continued to treat many severe jaw fractures among his civilian cases, and was still recognised as a leader in this field. For example, he was a member of the Oral Surgery Club of Great Britain, which held its annual meeting in Birmingham in 1938. At that meeting, Round demonstrated his methods in operations undertaken with renowned plastic surgeon Rainsford Mowlem, who became head of the Mount Vernon Unit during the Second World War. Round’s own son tragically died during the Second World War, while serving in Persia. A member of the Royal Army Medical Corps, J. H. B. Round had studied medicine at Pembroke College, Cambridge and the Westminster Hospital Medical School. Perhaps as a result of this loss, Round sought outand mentored other young practitioners interested in the emerging field of plastic surgery. Round himself took a less active role during World War Two, dying in his home in Edgbaston after a long illness in April 1947. Prof. Jonathan Reinarz is the Director of The History of Medicine Unit at the University of Birmingham. He is Professor of the History of Medicine.